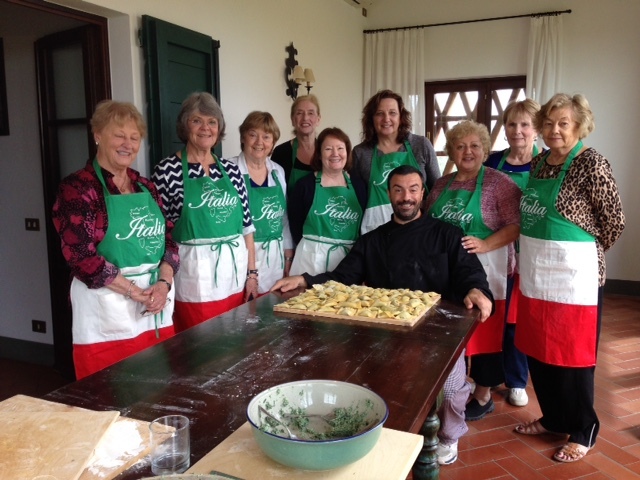 This is the 2014 Tuscany Cooking Group, soon off again to Pisa for our week of fun. Stay tuned for next year’s date. Many of The Women’s Travel Group trips are arranged so solo women can easily connect with the group if not flying with a friend or one of us. March 8 produced another terrific article about Rome where we start our Sweep Through Italy trip April 29-May 10 2015. Yes some women will arrive in Rome a day or two before the group, so here goes some of the newer Rome sights: MAXXI by Zaha Hadid, where the building even moves as you do, slanted floors and art made from lights/string/google users and more. The Times recommends Sunday at the second largest basilica: San Paolo Fuori le Mura, if St. Peter’s is too crowded for you. And I personally suggest The Jewish Area in Trastevere, easy to walk to across the river. The museum itself is a surprise, no matter what your background. And the young docents as interesting as the exhibits. Several told me the trace their families from traders who followed the soldiers, from, most likely, the Middle East to Rome. So if you are considering taking a last spot: here is the site and we accept all credit cards and can arrange your air. Ask for a share or a single. A Roman tip sheet from The Women’s Travel Group.